Friends, relatives and colleagues gathered in their numbers at the graveside of slain Sunday Leader Editor Lasantha Wickrematunge in silent vigil to pay tribute and recall the good times they had had with him, on the 10th anniversary of his death, at Borella, Kanatte, on Tuesday. Wickrematunge was assassinated while on his way to the Sunday Leader office on the morning of January 08, 2009, by a death squad widely believed to have been deployed by the then government, as part of a crackdown on the free media. The late editor, who exposed corruption in the then regime, particularly in relation to arms deals, was previously too subjected to attacks both to his person and residence, together with the Sunday Leader presses which were burnt down on one occasion. His newspaper constantly drew threats from the leaders and ministers of the then government for unearthing cases of fraud, corruption and financial irregularities in government agencies. In the weeks before Wickrematunge’s death, a wreath was delivered to him, as well as a copy of the newspaper with a line that said, “If you write, you will be killed,” in red paint. 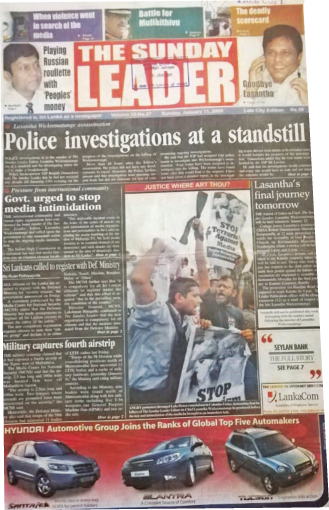 Ten years on, Lasantha’s killings still remains unsolved despite the questioning of a host of suspects and legal proceedings in courts. This year’s memorial featured a tribute by Minal Wickrematunge to other journalists slain in the line of duty, acknowledging that Lasantha’s story wasn’t the only one. White cards with Wickrematunge’s name and those of 18 other journalists were placed among the bouquet of white frangipani blooms. Lasantha’s niece Raisa Wickrematunge read out the message sent by Lal Wickrematunge – the slain journalist’s brother who lives in Australia, stating that the family was also grieving for other journalists killed by unidentified assassins. Lal Wickrematunge, in his message, said Lasantha certainly did not die in vain. “The foundation he set has brought about change in the political spectrum of Sri Lanka. This is visible today in the form of an independent Judiciary and other commissions. Willpower within those tasked with bringing such perpetrators, who violated all norms of humanity, before the law is the only step towards converting an otherwise barbaric nation to civility,” he said. Lal Wickrematunge said Lasantha was not the only journalist to lay down his life for penning what he believed in. Many journalists from the North were put down along with him during the darkest period in our nation’s history. We grieve for them today. Lasantha would insist on it. Investigations that were commenced since the Criminal Investigations Department took over have been exhaustive. It has been reported to Court that the Army Intelligence was behind the dastardly act. Others suspected of being the masterminds have been named in Court. Four persons have been killed in the cover-up. Four innocents. High-ranking Police officers are suspected of tampering with evidence. This was the state of our nation. Reconciliation and closure will not be possible without prosecution. There is no purpose in asking who Lasantha is. The world knows who Lasantha was. His writing has proven that and will last the test of time. Let his memory live forever. Veteran Nepali journalist Kanak Mani Dixit said he would remember Lasantha for how he lived, rather than the way he died, senselessly, at the hands of assailants twisted by hate. Lasantha’s childhood friend Peter D’Almeida, Nikkei Asian Review Asia Regional Correspondent and former Features Editor of the Sunday Leader Marwaan Macan-Markar and Lasantha’s lawyer Athula S. Ranagala also spoke at the memorial gathering. A forum titled ‘10 Years After Lasantha: Whither Investigative Journalism in Sri Lanka?’ was also held on Tuesday evening at the Lakshman Kadirgamar Institute of International Relations and Strategic Studies. Sunday Observer Editor and former Sunday Leader journalist Dharisha Bastians, AFP Sri Lanka and Maldives Bureau Chief Amal Jayasinghe, and Groundviews Editor and former Sunday Leader journalist Raisa Wickrematunge were among the speakers. The brave journalist who never bowed down to the corrupt and powerful had at the time become a challenge to many. The people’s call to bring the perpetrators of this murder to justice has still not been realised by those in charge. 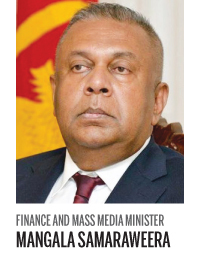 Finance and Mass Media Minister Mangala Samaraweera said the government has created an environment where journalists are not killed anymore and thus the pen has received its due prominence. The Minister was speaking to the media at the 10th death anniversary commemoration of slain journalist Lasantha Wickrematunge, at the Borella Cemetery on Tuesday. Wickrematunge was the former editor of the Sunday Leader newspaper and also served as a Colombo District SLFP organiser, as well as a secretary to former Prime Minister Sirimavo Bandaranaike. Minister Samaraweera added that Wickrematunge would have been happy with the media freedom journalists enjoy today. 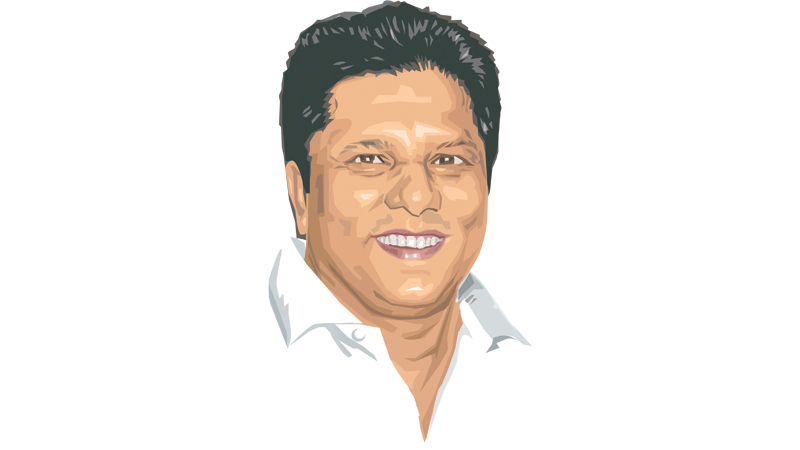 The only delay now is in finding the killers behind Lasantha Wickrematunge’s murder. The police are conducting investigations and they will soon be brought before the law, said the Minister. He said there have been times where murder investigations had taken 10 to 15 years, but the police in this case were doing their best to complete it as soon as possible. 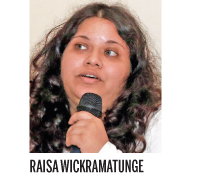 Raisa Wickrematunge, niece of slain journalist Lasantha Wickrematunge, yesterday said she still does not know what happened to her uncle and who is responsible for his murder. “Ten years later, we still do not have any answer about what happened to him and who is responsible for his murder,” she said. She said that at least some focus is on her uncle and people are discussing it. But there are many other cases which have not been discussed at all. Raisa said that cases with regard to many journalists in the North and the East have not been taken forward at all. “There is no progress in these cases. There are many journalists in the North and the East whose cases have not been taken forward at all, unlike my uncle’s, although progress has been slow in my uncle’s case. Referring to the investigations over the murder of Sunday Leader Editor Lasantha Wickrematunge and cartoonist Prageeth Eknaligoda, SLFP Media spokesperson Mahinda Samrasinghe said President Maithripala Sirsiena regrets the delay in the completion of investigations. Investigations into the assassination of Editor Lasantha Wickrematunge appear to have progressed in recent years, but more media pressure may be needed to ensure justice, said Amal Jayasinghe, AFP’s Sri Lanka bureau chief. Speaking on Tuesday at the panel discussion marking the 10th anniversary of the assassination of the Sunday Leader’s founding editor, Jayasinghe said court records showed significant breakthroughs had been made although more needed to be done to ensure prosecutions. “The 19th Amendment to the Constitution has delivered an independent judiciary as seen from the recent decisions of the superior courts, but the question is if our investigators have the same level of independence.